Despite almost four months of bombing Libya, NATO has still not succeeded in installing the regime it backs in Tripoli. Although the aerial campaign initially helped opposition forces maintain control of towns in the east of Libya, and Misrata, the capital Tripoli in the west of the country remains under Libyan government control – with NATO backed forces unable to significantly advance towards it for weeks. 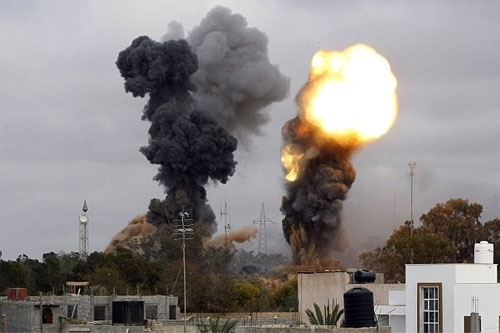 Whilst its lack of progress leads to some frustration and tensions within imperialism’s ranks, it remains determined to break the stalemate, so NATO has ramped up the air raids on western Libya since the beginning of July. The principal focus of the assault since March has been to try to crack the situation in Tripoli, the West trying to wear down the defence of the capital through attrition, laying siege from outside and bombing from above. Despite the support of Western air power, opposition forces have made slow progress on the ground as government forces have managed to hold their lines of defence. There are two prongs to the imperialist coordinated ground offensive towards Tripoli: from the city of Misrata (130 miles to the east) and from the mountains (approximately 140 miles to the south-west). The Western media, which if anything exaggerate any opposition advance, have been quite blunt. In the words of the BBC, the Misrata fighters just ‘inch their way westwards’ and to the south-west, a few miles’ advance is described as ‘the most significant confirmed advance… in the past few weeks’. Pro-Gadaffi demonstrations continue to take place in Tripoli. These are large, as can be seen on the internet, and some of these can be viewed below. CNN’s coverage of 17 June, the BBC’s and Libyan footage of 1 July give some sense of the scale of mobilisations taking place. It is clear that without support from the population Gadaffi’s regime would not be able to continue to resist the NATO offensive. This explains the West’s logic in bombing Tripoli, as it seeks to grind down the population. Given the scale of the bombing there are no doubt heavy casualties which both sides have reasons to under-report. The West claims it only targets combatants, so only admits to killing nine civilians, whilst the Libyan Ministry of Health puts civilian casualties at over 1,000 dead and 5,000 injured. Imperialism is effectively blockading Tripoli, so daily life for the population is becoming increasingly difficult with many necessities, including petrol, in short supply. The political and social alignment of the Benghazi-based opposition has become clear. It is in direct alliance with imperialism, dependent on it for arms, finance and direct military support. Additionally they indicate a willingness to act as a client regime should the imperialists install them in power, and have agreed to give Western companies more favourable access to Libya’s oil so the West will secure a greater share of revenues than the present Libyan government allows for. Opposition forces have also been reported unleashing racist violence in some towns under their control. Their claim to be fighting ‘foreign African mercenaries’ is being used as a pretext for harassment, torture and killing of black Libyans. The Wall Street Journal reported the ethnic cleansing of Misrata, where almost the entire black population of the city was driven out. Under the headline ‘Libya City Torn by Tribal Feud’ it said the ‘rebels’ refer to themselves as ‘the brigade for purging slaves, black skin’ and quoted the ‘rebel’ commander saying that the city’s black population ‘should pack up’. Human Rights Watch have also reported that opposition forces are abusing civilians in towns where they have seized control. Generally such brutalities are ignored by the Western media which pumps out endless, and frequently unverified claims of government atrocities. Confronted by its current failure to tilt the battlefield decisively in favour of the ‘opposition’, relations in the imperialist camp have become more strained. No Western state has shown any appetite for significantly increasing its commitment of resources; financial costs are mounting and none currently wants to deploy more ground forces in the Middle East. US demands that the European imperialists play a greater role are largely being ignored. So despite having publicly said it would limit its role to support efforts, such as surveillance and electronic warfare, the US is still flying hundreds of bombing raids. Large parts of US imperialism clearly do not regard its interests in Libya as warranting this level of resources. The US economy is barely recovering, its war in Afghanistan is going badly and it wants to increase its military presence in the Pacific region to pressure China. The result is more tensions, both within US imperialism and between it and the European states. US Congress discussions of the Libyan intervention reflect the internal US strain, with the House of Representatives in June symbolically voting against Obama authorising the bombing whilst at the same time giving him the funds to continue it. The European states are currently unwilling to boost their involvement. Britain and France, the most committed to the onslaught, are already stretched. They have significantly increased their cooperation these past 12 months, signing an unprecedented treaty last November pooling various military assets, collaborated to secure the UN Security Council resolution deemed to authorise the attack on Libya and recently coordinated their deployment of attack helicopters. Germany is looking more to the east and trade with China, and to a lesser extent Russia, as an economic way forward and is still not participating in the military attack on Libya. Italy says it is reducing its involvement in NATO’s campaign and is removing an aircraft carrier from the region, with Prime Minister Berlusconi now claiming, falsely, he was always against the war. Norway is withdrawing four of its six fighter jets by the end of July. There is a growing lobby within Europe for negotiations with Libya to be considered, which even France is encouraging; however this is rejected by the US and Britain who insist the priority is to carry on with the assault. The West has made some progress in reducing Libya’s international allies. Turkey, originally an opponent of the war, has swapped over to assisting the West and has offered ground troops in the guise of a UN peacekeeping force. Russia, followed by China, now both recognise the Benghazi-based opposition council as a representative of Libya’s people, although not as the ‘sole’ legitimate representative. Carrying less weight internationally, the overwhelming majority of semi-colonial countries in Africa, Latin America and Asia refuse to recognise the opposition council at all. In Britain sections of the left have entirely lost their bearings. It is an elementary socialist principle that the character of sides in a conflict must be judged by the social forces around them, not by their ideology or the political form of a government. In a struggle between imperialism and those in a semi-colonial country socialists have to support those opposing imperialism – the imperialists intend no good for the country they are attacking and their victory would strengthen imperialism overall. A regime such as Gadaffi’s is a petty local criminal compared to the imperialist mafia of NATO. In Libya the situation is clear. Imperialism is directly supporting those fighting Gadaffi – without imperialism’s support they would be defeated. Yet some who should know better are supporting the imperialist backed side. For example Socialist Worker has carried several articles supporting the Libyan ‘opposition’ despite its evident alignment with imperialism. Similar confusion is reflected in the position of Counterfire. Before the imperialist bombing commenced, Chris Nineham in an article titled No to a No Fly Zone: Why Western planes won’t help Libya (10 March) urged the West to ‘publicly recognise the legitimacy of the National Transitional Council and cease all oil payments to the Gadaffi regime.’ Similar positions were expressed in an article by Joseph Daher and John Rees. Some confusion on the social alignment of forces at the beginning of the struggle might have been understandable. But the character of the war has become totally clear. On one side are forces totally allied to NATO and imperialism. On the other side are forces fighting that imperialist assault. But despite this the SWP and Counterfire continue to back the side in the war allied with imperialism. Imperialism is carrying out an assault on a semi-colonial country – it is evident which side socialists should be on. It is ridiculous to claim to be opposing imperialism while supporting the side it is backing. The principal task of socialists within the imperialist countries carrying out this assault is to place every possible obstacle in imperialism’s path. In Britain that means building up the strongest possible movement of opposition to the war. Protests against the attack on Libya called by Stop the War Coalition and CND should be given support and every effort made to strengthen and widen the anti-war movement.